Completely redesigned, the new 2014 MDX is focused on delivering four things to luxury SUV buyers, according to Acura: prestige, comfort, top-level safety, and class-leading fuel economy. To achieve these goals, the 3-row, 7-passenger crossover is built on its own platform, is equipped with a new powertrain, and is a likely candidate for Acura’s future Sport Hybrid version of its available Super Handling All-Wheel-Drive (SH-AWD) powertrain. Two versions of the 2014 MDX are on sale: a front-wheel-drive MDX model and the MDX SH-AWD. Each can be equipped with a Technology Package, a Technology and Entertainment Package, or an Advance and Entertainment Package. Details about the technology included in the MDX’s option packages are offered below. In addition to those items, the Technology Package includes satellite radio, HD Radio, a premium audio system, Smart Entry functionality for all four doors, and 19-inch aluminum wheels. Add the Technology and Entertainment Package, and the MDX gets a 9-inch rear-seat entertainment screen, a 110-volt power outlet in the front center console, a ceiling-mounted rear center speaker, rear window sunshades, and heated second-row seats. The Advance and Entertainment Package includes everything listed above, everything listed below, and premium leather upholstery, heated and ventilated front seats, dual ceiling speakers, HDMI input jacks, auto-dimming side mirrors, and front and rear parking sensors. Every 2014 MDX is equipped with a direct-injected 3.5-liter V-6 engine that makes 290 horsepower while burning premium fuel. The engine powers the SUV’s front wheels through a 6-speed automatic transmission equipped with paddle shifters, Grade Logic Control, and Shift Hold Control. Towing capacity is 3,500 pounds. 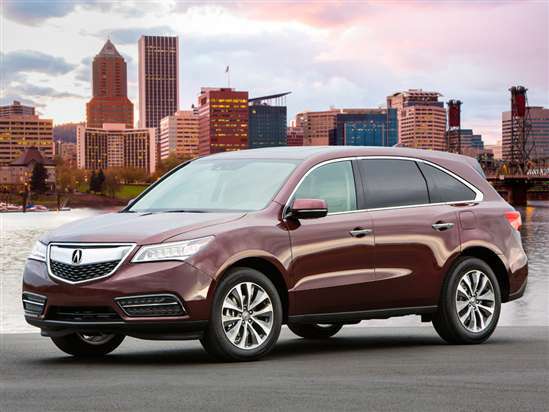 The MDX SH-AWD models are equipped with the same engine, paired with Acura’s torque-vectoring all-wheel-drive system. When properly equipped, the MDX SH-AWD tows up to 5,000 lbs. With FWD, the MDX is rated to get 23 mpg in combined driving. Choose the MDX SH-AWD model, and the combined driving rating is 21 mpg. As this summary is written, neither the National Highway Transportation Safety Administration (NHTSA) nor the Insurance Institute for Highway Safety (IIHS) has performed crash tests on the redesigned MDX. The new MDX is equipped with standard Jewel Eye LED headlights, a multi-view reversing camera, and Bluetooth connectivity with text-messaging and email assistant features. Add the Technology Package, and the SUV is equipped with a navigation system, voice recognition, a music storage hard-drive with Song by Voice track retrieval, and AcuraLink. Additionally, this upgrade installs a Blind Spot Information System, a Lane Departure Warning System, a Forward Collision Warning System, and a climate control system that takes GPS vehicle position into account. An Entertainment Package is offered with the Technology Package, adding a rear-seat entertainment system. The Advance Package includes a 16.2-inch wide-screen rear-seat entertainment system plus Adaptive Cruise Control with Low-Speed Follow, a Collision Mitigation Braking System, a Lane Keeping Assist System, and remote engine starting.